Single-track download sales in the US have crashed by 42% since their peak just four years ago – sparking the real possibility that they could become a dead format within half a decade. In the first half of 2016, single-track download purchases plummeted by 24% year-on-year, falling by 127.3m sales compared to the same six months in 2015. Should the US download market continue to see that level of sales disappear each year, music purchases on the likes of iTunes would be rendered non-existent by 2020. According to historical Nielsen figures, H1 2016’s haul of 404.3m US download sales was down 42% – or a painful 293.7m – on 2012’s peak tally of 698m. 2016’s 24% year-on-year fall in track downloads compares to a 10% annual fall between 2014-2015 and a 13% drop in 2012-2013 – a hefty jump in the rate of decline for iTunes. Consider that a typical hit music download now sells for $1.29 in the US, and the H1 drop in downloads since 2012 represents a fall of comfortably over $300m a year for the music business and its digital retail partners – especially Apple. Where’s that money gone? Try audio streaming, which just jumped up 97.4% in consumption terms year-on-year in the US. According to Nielsen, 113.6bn audio streams took place in the US in the first half of 2016. That equates to around 620m streams every day, 26m streams each hour, and 431,000 streams every minute. And that doesn’t even take into account video platforms like YouTube. Analyst Mark Mulligan at Midia doesn’t forecast that downloads will be gone completely by 2020 – but that’s when he believes Apple will ‘turn off’ the iTunes store in music. “By 2020 [Apple’s] download business would be tracking to be 10 times smaller than streaming revenue but, crucially, streaming revenue would nearly have reached the 2012 iTunes Store download revenue peak,” he wrote in May. Clearly, the consumer transition from downloads to streaming is gathering pace – with plenty more damage to be done to iTunes yet. 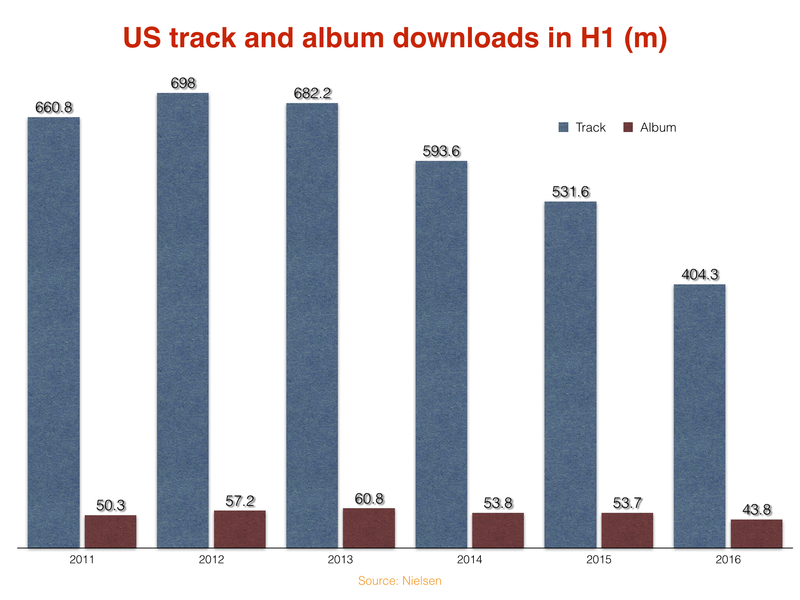 Case in point: should six-month US track downloads fall by another 127m next year, 2017’s half-year sales sum will hit 277m… less than half the six-month download tally seen as recently as H1 2014. 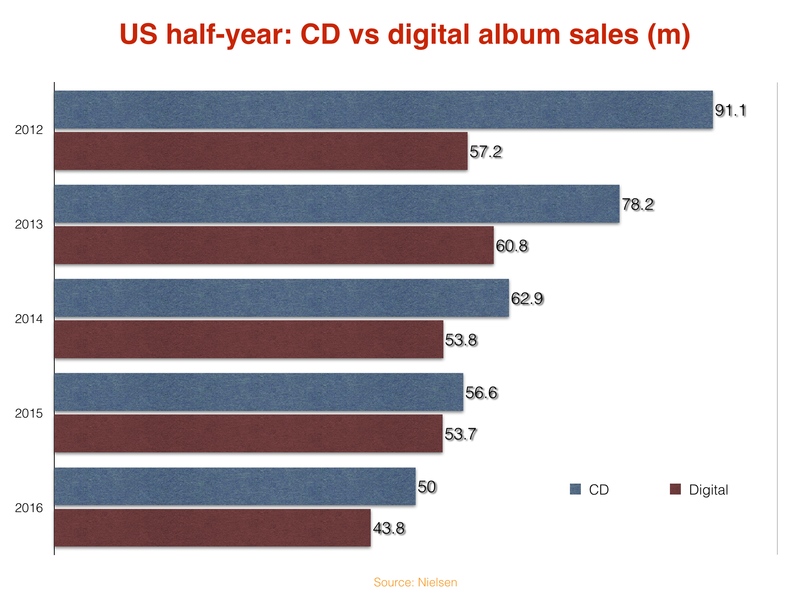 So what of digital album sales? They fell 18.4% in the US over the past year – or by 9.9m sales – according to Nielsen’s six-month stats, having remained flat in 2015. If half-year downloads continued to fall at 9.9m sales a year in the US, they would be in single figures by 2020 and vanish by 2021. Obviously, you would expect this rate of decline to soften as the years wear on, but the worst for the iTunes store may be yet to come. With CD declining by 11.6% in H1 2016, it looks like physical albums may have now seen off the threat of being superseded by downloads… as both continue to fall in the streaming age.